The 34th Singapore Bird Race took place on Sunday, 11 November 2018 at Sungei Buloh Wetland Reserve. This year’s race saw 31 teams competing in three categories – Birder, Photographer and the first ever School category. 9 teams from 4 schools competed for the coveted championship trophy and shield donated by Minister Desmond Lee. Also for the very first time, a Best Picture Contest was organized. This was made possible by the generous contributions from our main sponsor, Sony. Sony loaned out their RX10M4 to all participants who wanted to compete in this category. This year’s race was organized in partnership with Sungei Buloh Wetland Reserve, Friends of Buloh, Birdlife International, East Asia Australian Flyway Partnership, Nature Photographic Society Singapore and PUB. A BIG thank you to main sponsor Sony, venue sponsor Sungei Buloh Wetland Reserve and other sponsors including Swarovski, Vortex and John Beaufoy Publishing. And another HUGE thank you to all volunteers for making this event possible. 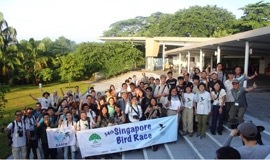 Also many thanks to all participants for your support in making this another successful Singapore Bird Race and congratulations to all prize winners. Stay tuned for the results to be published soon.